Happy Autumn everyone. It was made for us calicos don't you agree? Our human is crazy busy this month and decided to sneak in this stellar portrait of us for our Caturday Art pic. Wishing all of you a wonderful season!!! Very pretty! And of course I agree, autumn was made for the most colorful cats! Isn't there a group The Ladies of Autumn for calicos???? We Meezers can sneak around among the colorful leafs too. MOL! What a beautiful post, Peaches and Paprika! I love calicoes, and I love autumn, so this is purrfect! You both look beautiful with the Fall colours. You are the perfect Autumn Ladies!!! Nice to see you two beauties. You are definitely made for Autumn. Happy fall. You both look so cute all cuddled up. 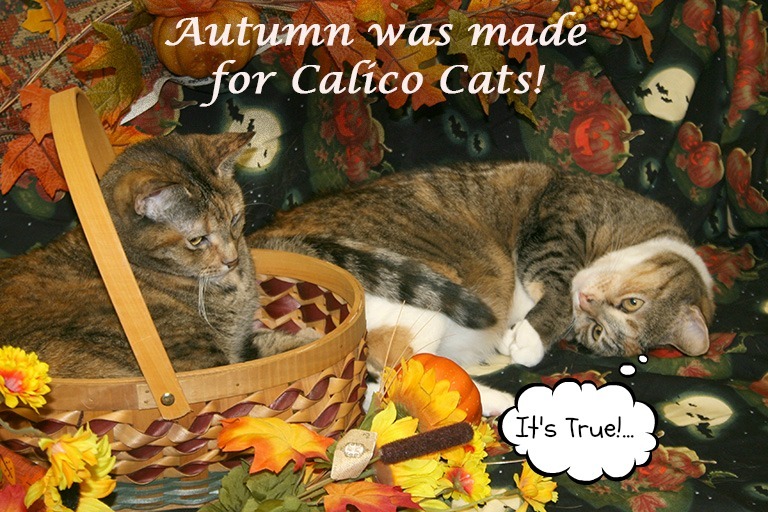 That's why they calls calicos the Ladies of Autumn. Gramma had a calico named Autumn. Nothing worse than a BED HOG! Share and share alike I say!